Homemade tofu is healthy tofu....no preservative but of course lots of work involved. First you have to make your own soy milk, then add eggs to the soy milk , steam at the right temperature...this part of course is the easiest but it is the making of soy milk that takes time. Once you have the soy milk ready, then the rest is easy. to line the loaf pan so that it is easy to lift the tofu out when it has cool down. Blend all ingredients in a food processor into a smooth paste. 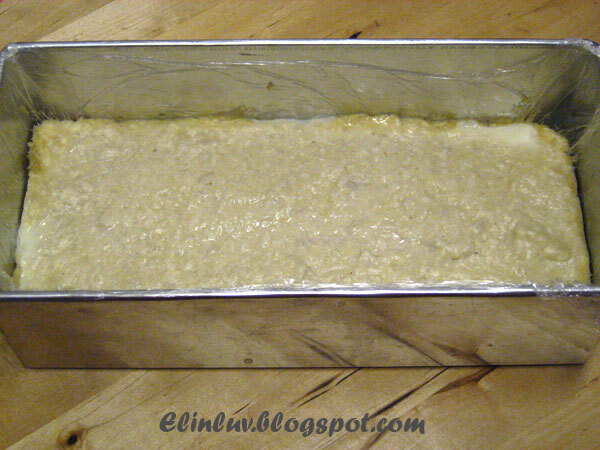 Pour the paste into a large oiled pan ( you can use cling wrap to line your pan ) Steam for 20 minutes. Remove and set aside to cool. Cut to the size you desire. Heat up oil in a wok, add in the garlic and saute till fragrant, add in the mushrooms and leeks and stir fry till the mushrooms are cooked, add in the gravy mixture and mixed well with the leeks and mushroom and cook till it thickens. 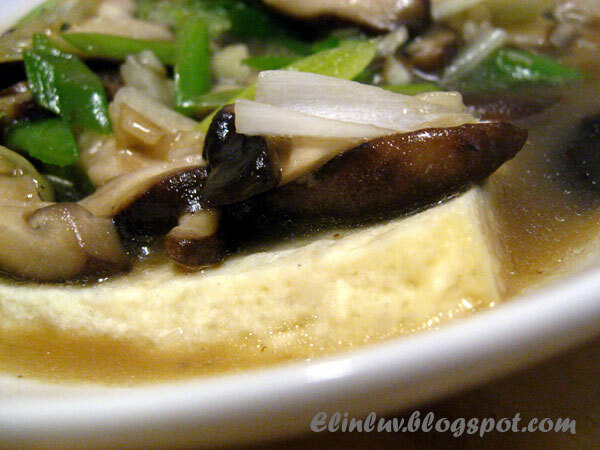 Dish up and pour over the sliced tofu and served hot . This is healthy and nutritious. 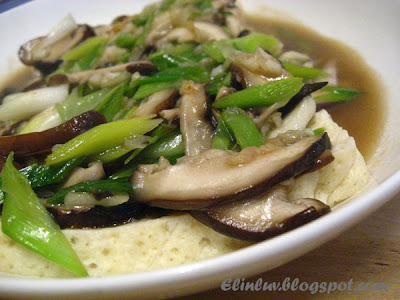 But making the tofu from scratch, mmmm .... have to think twice, lazy me! wow luks so delicious and yummy.My all time favourite. It's really tough to make tofu at home. But, it's worthy effort. I'm very impressed with your homemade tofu! WOW! Thanks for posting the recipe, including your mistakes is a generous act. We all make them and it's the best way to learn. Thanks. Quite a challenge making your own tofu, and I take my toque (chefs hat) off to you! No worries about the air pockets in the tofu, and I suppose there are presses you can make that would help to remove them. We use heavy bricks that have been wrapped with several layers of plastic and then foil and weight down our terrines and this helps to remove air pockets, just and idea. Ya Elin, fish paste can course the texture more spongy and nice. I like this simple recipe too. See, we can't purposely go to buy a soy bean machine just for this, right? Hope you're enjoying your day. p/s still waiting for Jo's massages? 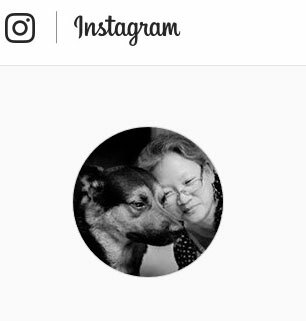 Well, she'll be back very soon. Mmmm....my perfect dinner meal! I love homemade egg tofu too. I'm glad that I can get unsweetened soya milk so making this tofu is a lot easier. Quite sometime I have not made. Need to make soon. 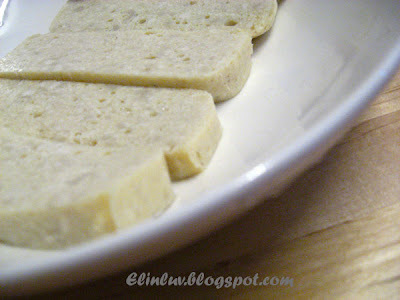 Your homemade tofu reminds me of Japanese egg roll =) I have to try your recipe! wow! You made your own tofu! Very impressed! I love all kinds of tofu. It's ok with the air pockets. Gives it a different texture but I am sure it is still very delicious. Love the topping too. 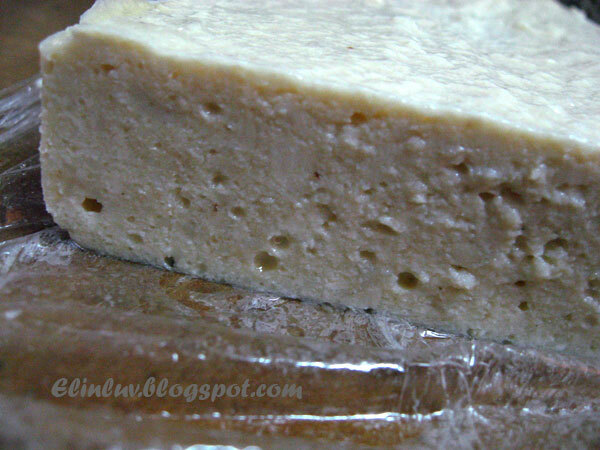 homemade tofu, oh how great ..what mistakes??? I love it!! 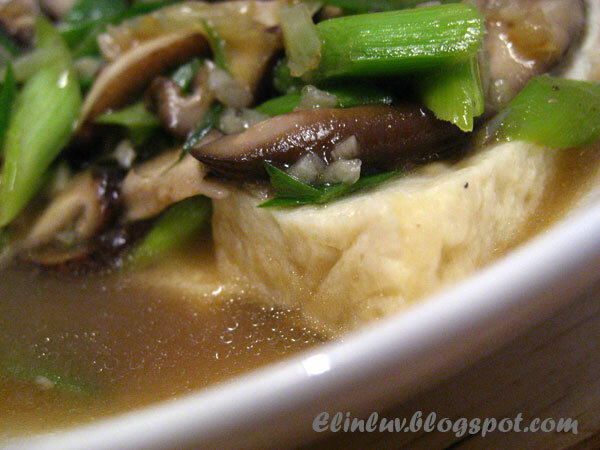 Love the homemade tofu...so fresh and healthy! Hi Grace, Biren , Sweetlife and Angie ...:) this tofu may not llok smooth but it is. Do try it out but please use a food processor so that it has a finer texture than mine. I love tofu so healthy and delish ! Wow! homemade tofu! i will have to give this a try! thanks for the recipe!